For ten days I watched the Calgary Stampede. As the events unfolded - winners in Pool A, winners in Pool B, winners from Wild Card Saturday, then one champion declared for a cheque of $100,000 - a truth emerged from the arena dust (or mud!). A deep connection exists between the competitors. Contestants were competitive to be sure with such a huge prize at stake, but they were also supportive of one another. 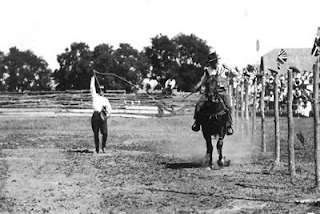 Bull riders pulled ropes for contestants that would leave the chute and beat them; bronc riders held plastic bags over reins and gloves of fellow competitors in the chute when it rained to keep them dry; steer wrestlers and calf ropers slapped one another on the backs even when the run took them out of the money and maybe out of a chance for $100,000! 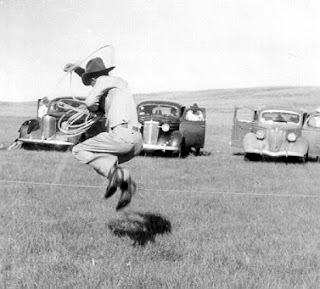 I had competed at a rodeo in Wood Mountain, Saskatchewan. As I had done so many times, I travelled alone with my three children, my dog, Tanya, and of course my barrel horse, Duchess. After the rodeo, I loaded and left the grounds, mentally preparing for the long drive home to Crooked River. I wasn't looking forward to the first 60 miles because the road was not good, but I thought I could get to Moose Jaw before dark and the rest of the trip would be on pavement. A few miles out of Moose Jaw, I suddenly knew I had forgotten something in Wood Mountain - my dog! I could hardly face the trip back over the rough roads to get her, but I must. I thought perhaps one of the cowboys was still at the grounds and coming my way. That would save me the trip. But how would I find out? From a phone booth, I looked up the number for a cowboy who lived there. Maybe he could find a ride for Tanya to Moose Jaw. It would mean waiting, but better than going back. I dialed Dan's number. "Hi, Dan. This is Sharon." Dan had seen Tanya start to follow my outfit as I left the grounds. When she saw that she could not catch me, she turned around and sat down where we had been parked. He picked her up and took her home. "I knew you would be calling," he said. "Stay put. I'll bring her to you." And he did. He said she rode on the front seat with him all the way. A "thank you" from me was all he would take for his trouble. I can't describe how grateful I was, not only for him rescuing my dog, but also saving me pulling my outfit over the gravel road again. I no longer rodeo and have not for many years. It's all about reining now - I show at reining shows. I sense a different "feel" between rodeo and reining shows. Although reiners enthusiastically support their "group", sometimes general support is lacking. 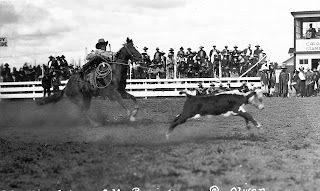 In the short go of the barrel race at Calgary Stampede, Lindsay Sears ran third out of four. She posted a very fast time. I'm sure in the minds of most, including Lindsay, she would be the fastest, but the last rider, Savanah Reeves, on her strong palomino, bested that time by .06 seconds and would take home the $100,000. Since all the champions are immediately awarded trophy and cheque, she must run to the podium to collect her awards. The camera panned to Savannah, just off of Thunder . . . and Lindsay Sears, who had just lost the championship to Savannah, reaching for the cinch to loosen it, waving her to go (I could imagine her saying, "I'll look after Thunder. Just go." That's more than good sportsmanship. I felt the tears coming to my eyes watching this little scenario unfold . . . and thinking about another day at a recent reining show when a rider, late arriving for her class, scrambled to tack up her horse and herself - by herself! Although a spectator/horse breeder stepped in to help, not one of her fellow competitors offered help or encouragement. At a reining show a couple of years ago, my dog (another Samoyed) got loose from my camper and came to the arena where I was riding, no doubt to find me. "Who's dog is that? Get her out of here!" I jumped off of my horse to collar her and take her back to the trailer. That's a long way from "I've got her!" I could be wrong, but I don't think it would be a stretch to believe that, if it had been a rodeo, I would have heard similar words . . . or another Dan would have rescued my dog. Hats off to the cowboys and cowgirls! That is the question! (Sorry, Shakespeare, for the rough paraphrase...) When it comes to selling my horses, sometimes I don't know the answer. "You must find it hard to sell your horses," a friend remarked just the other day. Indeed, I do - especially those I have trained and ridden. That many hours in the company of an animal forms a bond. It doesn't matter how many horses I train, each one is an individual deserving of my respect and attention. I have been with most since they were born. Many times I was the first living thing they saw - even before their mother! I witnessed their first steps, their first meal. I watched them play, discover the world. I haltered them the first time, encouraged them to follow me and not be afraid. I picked up their feet, trimmed them, treated their "owies" and then, at two years old, I saddled and bitted them for the first time. My weight was the first weight they felt on their backs, the first person they carried. Each learned to listen for "good girl" or "good boy", words from my mouth. They looked to me for confidence when they entered the show arena or walked down a new trail in the bush. And of course they looked to me to bring them feed and fill their water troughs. Is it hard to sell my horses? Yes. But I am in the business of raising and selling horses, so sell I must. Sometimes I am not a good business woman - every horse is not for sale; I have bought horses back to be with me; I have turned down good offers because I didn't want to part with one of my horses. Do I regret that? No. Do I sometimes regret selling one of my horses? Yes. Most times, though, I am very happy with my horse's new home. 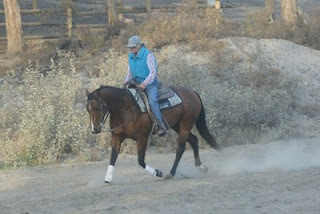 I recently sold Wildwood Splendor, a mare I originally intended to keep for a Working Cowhorse. She is going to a young man I coached many years ago, a family man with a kind heart. Splendor will be well cared for, loved, and used, which is a good thing because I did not have time for her here. When I saw him ride her, I knew his was the right home. Still, it's easier to sell my horses before I have ridden them, spent all those hours on their backs. It's a little easier to see a weanling or yearling leave my yard because I have only spent a short time with those. To sell or not to sell - that is the question, one I have to answer when I offer one of my horses for sale ... and live with my decision.